The water turbine (also known as a hydro turbine or hydraulic turbine) was developed in the nineteenth century and was widely used for industrial power prior to electrical grids. Today, water turbines are mostly used for hydroelectric power generation. The hydro turbine harnesses a clean and renewable energy source. Water wheels have been used for thousands of years for industrial power. The main shortcoming of the water wheel is size, which limits the flow rate and head that can be harnessed. The migration from water wheels to modern turbines took about one hundred years. Development occurred during the Industrial revolution, using scientific principles and methods. They also made extensive use of new materials and manufacturing methods developed at the time. As water sources vary, water turbines have been designed to suit the different locations. The three main types are Pelton wheels, Francis turbines, and Kaplan or propeller type turbines (named after their inventors). All can be mounted vertically or horizontally. The Kaplan or propeller type turbines can be mounted at almost any angle, but this is usually vertical or horizontal. The precise shape of hydraulic turbine blades is a dependant on the supply pressure of water, and the type of impeller selected. Following is a list of water turbines divided into two groups - reaction turbines and impulse turbines. Reaction turbines are acted on by water, which changes pressure as it moves through the turbine and gives up its energy. They must be encased to contain the water pressure, or they must be fully submerged in the water flow. 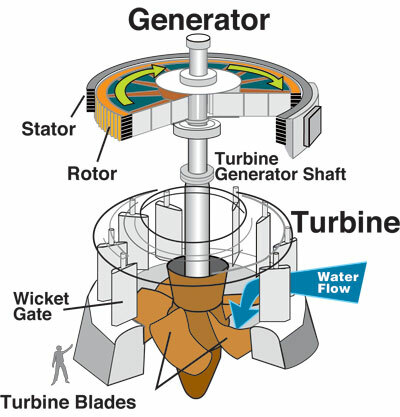 Most water turbines in use are reaction turbines. Impulse turbines change the velocity of a water jet. The jet impinges on the turbine's curved blades which change the direction of the flow. The resulting change in momentum causes a force on the turbine blades. Prior to hitting the turbine blades, the water pressure is converted to kinetic energy by a nozzle and focused on the turbine. Turbine selection is based mostly on the available water head, and less so on the available flow rate. In general, impulse turbines are used for high head sites, and reaction turbines are used for low head sites. Kaplan turbines with adjustable blade pitch are well-adapted to wide ranges of flow or head conditions, since their peak efficiency can be achieved over a wide range of flow conditions. Very large Francis and Kaplan machines usually have vertical shafts because this makes best use of the available head, and makes installation of a generator more economical. Pelton wheels may be either vertical or horizontal shaft machines because the size of the machine is so much less than the available head. Some impulse turbines use multiple water jets per runner to increase specific speed and balance shaft thrust. The water turbine is generally considered a clean power producer, as the turbine causes essentially no change to the water. They use a renewable energy source and are designed to operate for decades. They produce significant amounts of the world's electrical supply. Historically there have also been negative consequences, mostly associated with the dams normally required for power production. Dams alter the natural ecology of rivers, potentially killing fish, stopping migrations, and disrupting peoples' livelihoods. Dams also cause less obvious, but potentially serious consequences, including increased evaporation of water, build up of silt behind the dam, and changes to water temperature and flow patterns. In the United States, it is now illegal to block the migration of fish so fish ladders must be provided by dam builders. The actual performance of fish ladders is often poor. The water turbine plays a significant role in reducing our reliance on traditional fossil fuel derived electricity. Click here to read about other topics related to water energy.